Government Shutdown’s Impact on Filings and Refunds. How could the government shutdown impact my tax filing? As we sit here today on January 21, 2019, the government shutdown is now approaching its 30th day. Politics aside, government workers, contractors that work on government contracts, and millions of others who service or transact business with these families have been impacted, and for that reason, we all wish that this would come to a quick resolution. Despite the government shutdown, and a majority of IRS offices either closed or understaffed, tax season and tax filing deadlines move forward. We hope this brief update will help you navigate the potential impact the shutdown may have on you. First, if you are currently attempting to resolve a dispute with the IRS please take note of the following: If you are trying to communicate with the IRS to clear up a tax notice received by the IRS through submission of additional documents or phone call/fax correspondence; our office suggests that any payment or documentation being mailed to the IRS be sent through certified mail with tracking. Packages often get misplaced or lost when sending to the IRS during normal working conditions, and the likelihood that this will occur in a government shutdown is much greater. As always, keep copies of your documents you send in, proof of mailing receipt, and make notes for future reference. Our office has been largely unsuccessful in attempts to speak with a live person at the IRS since the shutdown. We have been unsuccessful in attempts to fax documents to the IRS during the shutdown, receiving a kickback on all faxes sent since the shutdown began. When the shutdown does end, expect even longer call times and difficulty getting in person appointments with the IRS as their schedule will be heavy for a few months following the shutdown. It is our understanding that the IRS is accepting submission of tax returns, and as stated previously no filing deadlines have been adjusted as a result of the shutdown. So keep getting your tax documents loaded into our Intuit Link portal link.intuit.com so that our staff can prepare your return in a timely manner. The final impact that a majority of taxpayers are concerned about is the issuance of tax refunds. We have received mixed signals on the impact the shutdown could have on your tax refund. In prior shutdowns tax refunds have been delayed. However, the current administration has committed to the public that refunds will not be delayed. As of 1/15/2019 60% of the IRS workforce had been re-called to their positions to ensure that during the shutdown refunds could still be issued. We urge our clients that are concerned about receiving their refunds to take time to make sure they have collected all of their tax documents, submit them to our office and file for a refund using direct deposit for the 2019 filing season. Properly collecting tax documents will ensure that the IRS does not hold up your refund. In addition, clients will need to review and monitor their checking account to ensure that a correct refund was deposited after submission. Although no delay is expected in issuing refunds we could see an influx of early submission of tax returns from US taxpayers in general, which could overload the already limited number of IRS staff currently working. If you have additional questions regarding the shutdown and its impact on your tax return, please contact our office. As always, we look forward to working with all our clients this tax season. Happy Holidays and Happy New Year From K&R Certified Public Accountants. We want to take this opportunity to thank our customers, employees, family and, friends, for another great year. Happy Holidays and Happy New Year. 2018 Tax Changes: Tax Cuts and Jobs Act’s impact. As we approach the end of the year, we hope that 2018 has been a successful year for you, your business, and your family. We want to share with you a number of important tax items and changes as the end of the year approaches. Since September, our staff has been meeting with clients to plan for the end of the year, working with many of our small business owners to ensure they are on track for our 2018 tax plan and begin putting into place a 2019 tax plan. We still have some time in the next few weeks to meet and go over your tax needs. If you cannot make it in before the end of the year, we can meet with you in 2019 to address any questions you may have. In this blog, we will highlight the impact of the Tax Cuts and Job Act, passed in late 2017. The biggest change for almost every taxpayer is the new tax rates. The new tax rates include the following percentages, 10%, 12%, 22%, 24%, 32%, 35%, and 37%. If you are a married couple with taxable income between $77,000 to $165,000 you fall in the 22% tax range, married couples making more than $165,000 but less than $315,000 will fall in the 24% tax range. For a full breakdown of the tax brackets please visit our website www.stltaxprep.com/blog and view our December 24, 2017 entry regarding the tax update. The Alternative Minimum Tax (AMT) has been adjusted to impact fewer taxpayers. This is a relief for taxpayers who had previously been impacted by AMT. The standard deduction was almost doubled from $12,000 to $24,000. This change along with the limitation of State and Local Income Taxes (explained below in item 7) could result in fewer taxpayers that itemize their deductions for 2018. Dependent and personal exemptions were removed. In replace of this lost deduction is the increased child tax credit discussed below. A majority of the changes for individuals are temporary and set to revert back in 2026 unless extended by Congress. The child tax credit has been increased from $1000 to $2000 per child. The credit was expanded to higher-income taxpayers, phasing out at $400,000 for joint filers and $200,000 for single filers. There is also a $500 credit for dependent adult children or elderly parents. The increased credit and increased phase-out limits will help offset the loss of the personal exemptions. Personal casualty losses have been removed from the tax code. Unreimbursed employee business expenses have been removed from the tax code. This means that miles not reimbursed by an employer cannot be deducted on your personal return. Tax preparation fees for individuals are no longer deductible. Legal fees, job search expenses, safe deposit box fees, moving expenses, and investment expenses all have been removed from the tax code. Interest on Second Mortgages or Home Equity Lines of Credit (HELOCS) can only be deducted when used to buy, improve or build a home. No longer can the interest be deducted if you are pulling money out to pay for college, car, or other non-home related expenses. State and Local Income taxes, including property and real estate taxes, are limited to $10,000 annually. Alimony payments made after 2018 are no longer taxable or tax- deductible. There is no longer a penalty for not having insurance after 2018. You can now use 529 accounts for elementary or secondary education. Up to $10,000 per year can be withdrawn. The annual gift tax exemption remains at $15,000 per person per individual receiving the gift. Kiddie tax law has changed significantly. Minor children with unearned income will pay higher taxes. Contact our office to learn more. The corporate tax rate for Corporations, taxed as a C Corp, (not flow through entities) is a flat 21%. One of the changes for a majority of our business owners is the 20% deduction of qualified business income. This deduction is available for most taxpayers who make under $315,000 in combined taxable income and available for those that make over this amount if they are not in a specified service business. If you have an LLC, S Corporation, Partnership or sole proprietorship and need help navigating this change in the tax code please contact our at (314) 720-8686 office today to schedule a tax planning session. Entertainment expenses such as sporting event tickets are no longer tax-deductible as entertainment-related expenditures. Remember if you operate a trade or business and have paid vendors more than $600 for services, rents, or prizes that vendor should receive a 1099 form. Please contact our office if you would like assistance in preparing your 1099 Forms. 4th Quarter Estimated tax payments are due January 15, 2019. Contact our office today for help with your final 2018 tax payment. Invites for our online electronic portal called Intuit Link, supported by ProConnect Intuit will be coming out by the first of the year. If you do not receive your invite by January 5, 2019, please contact our office and we can resend the invite. In 2019, K&R Certified Public Accountants will be uploading all completed tax returns into the Intuit Link portal so that our clients have year-round access to their finished tax returns. We’re making access easy for all of our Missouri business and individual clients. Have a great Holiday and Happy New Year. 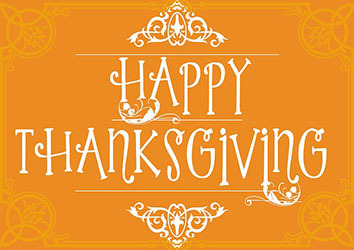 Happy Thanksgiving from all of us at K&R Certified Public Accountants. K&R Certified Public Accountants want to take this opportunity to wish our employees, clients, friends, family and our Missouri neighbors, a safe and Happy Thanksgiving. Take the day off and count your blessings. 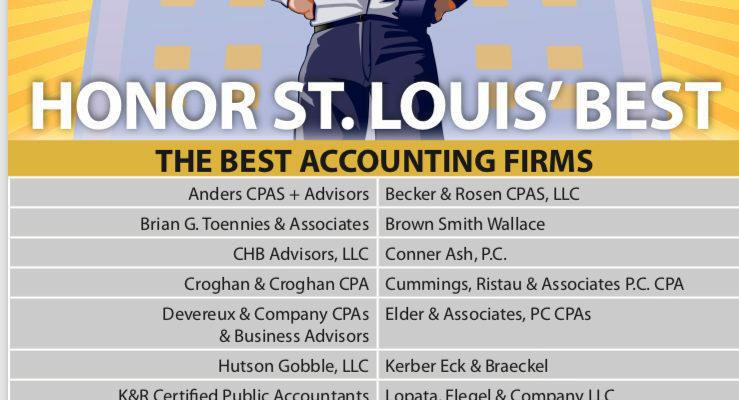 St. Louis’ Best Accounting Firms. St Louis’ Best Accounting Firms: K&R Certified Public Accountants. We are proud to be named one of St. Louis’ Best Accounting Firms by Small Business Monthly. We are proud to be named and it’s an honor to know that St. Louis businesses trust us with their accounting, Quickbooks, and tax preparation needs. We are here to serve St. Louis businesses of all sizes and help them keep on top of their financials, taxes, and accounting needs. How can K&R Certified Public Accountants help your St.Louis or Missouri business with your accounting needs?